Nowadays if you want to eat satay from Kajang, you don't need to travel too far as the famous Sate Kajang Hj Samuri has eleven outlets for you to choose from. For both of us, it just meant driving towards Damansara Uptown where they had an outlet that is right next to Woods Eco-Cuisine Cafe. Sate Kajang Hj Samuri is the most successful satay operator from Kajang and it's a huge business with outlets everywhere. Most of their outlets are located along the highway stops like Sungai Buluh's overhead restaurant, Kesas Highway, Elite and Guthrie Highways. 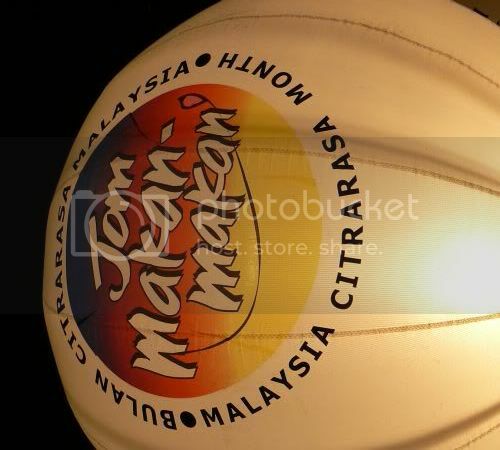 There are also bigger outlets at Putrajaya, Bukit Tinggi and Senawang. Their satay stands out from the rest as the portions are bigger at RM0.60 per stick for the chicken, beef, tripe, liver and fish varieties. 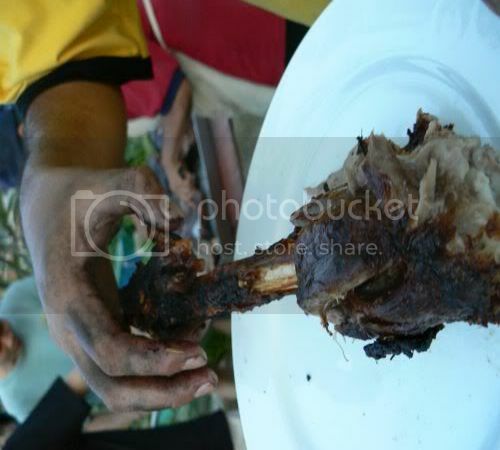 They also serve lamb at RM0.90 per stick, deer at RM1.30 per stick and rabbit at RM1.60 per stick. Besides a bigger portion you get on a stick, they have also removed all the pesky fats and chewy bits from the meat making it an easier meal for everyone. 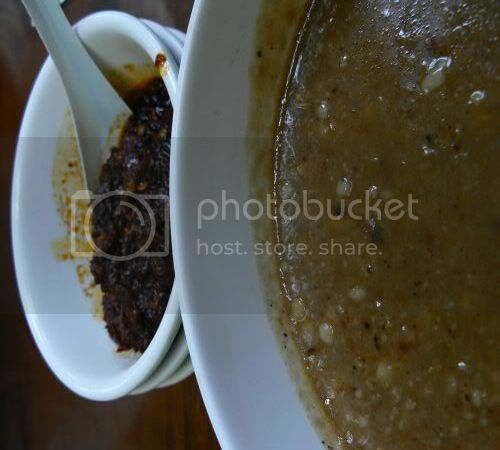 The other thing I absolutely love about them is their very thick peanut sauce which comes with the sambal seperate. You can add as much sambal as you like to give it all the kick you wish. 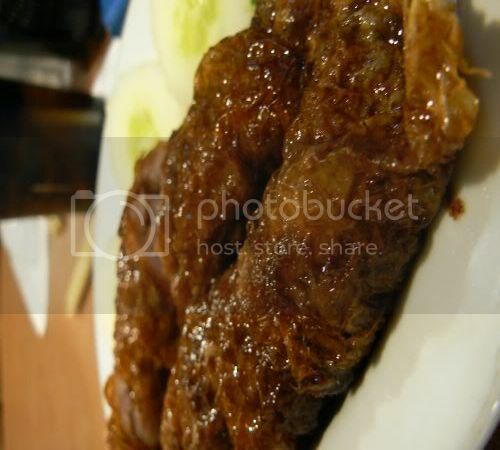 A must have of course is the Nasi Impit (Compressed Rice Cubs in English) that goes so well with the sauce. If you wish for something besides satay, the outlet also serves nasi goreng, nasi paprik and mee bandung. 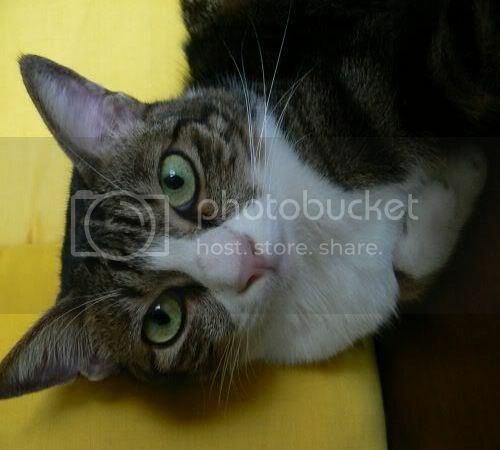 This weekend, I thought I will share with you a picture of the Mummy cat. 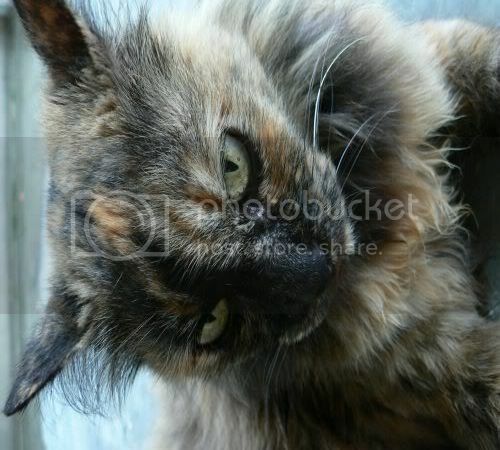 She's actually not our cat but the neighbour's but she spends so much time at our place she is part of the family. Fluff Puff is so attached to her mother that she will be constantly at her side. Ever since we had her "snipped", she's a really happy cat and growing super fat from all the food we feed her. Incidentally, I found a new fix - adorable kittens on a daily basis at dailykitten. They are so addictive and cute. For my kitty kats - tune into eat stuff and the round up. How to get crispy fried shallots? 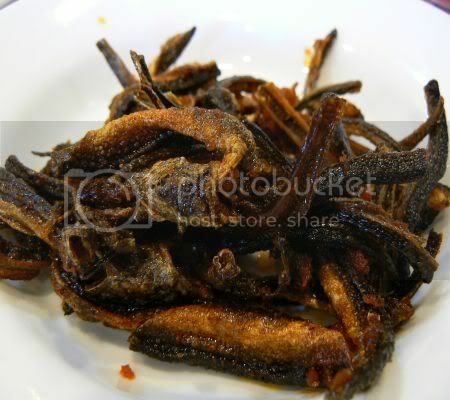 I was surfing the Net, browsing through blogs and found Lilian of Malaysia Best's question regarding crispy shallots. Although the ones we make at home are crispy after they emerge from the hot oil, they turn soggy with time hence they need to be consumed immediately. As fried shallots are added into almost every kind of food to add taste especially hawker type food, manufacturers have devised a method to keep them crispy. The urban legend claims the manufacturers add plastic to keep the shallots extra crispy. 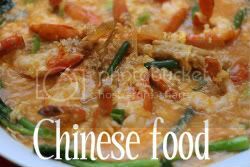 "Sprinkle some rice flour into sliced shallots and mix well before frying. Drain out fried shallots when it turns golden brown. Keep crispy shallots in an air tight container to enjoy crispiness for a month"
"After removing the sprout tails, soak in a basin of ice cubes with a dash of salt. The result is crunchy fresh and white sprouts"
Hope you enjoy the tips and do give me feedback if the tips work or don't work! 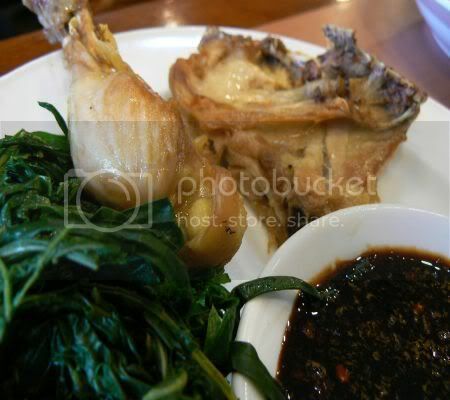 Recently we wandered towards Bangsar to look for food to fill our tummies. I must admit, nowadays we rarely wander towards that area hence it was refreshing to drive around the Telawi area to note the changes - Grappa's being sealed from a Writ of Seizure and Sale due to monies owed, a new restaurant at the corner facing the famous red tablecloth chinese restaurant called Shanghai 10, a new Italian restaurant where the art gallery used to be next to MPH called Cipolla (I thought it was "Cheapo-Lah" at first) and the emergence of a huge big building block opposite Devi's Corner which signals more shops and food outlets. We also saw the authorities who were extremely diligent in issuing tickets and towing wayward cars. 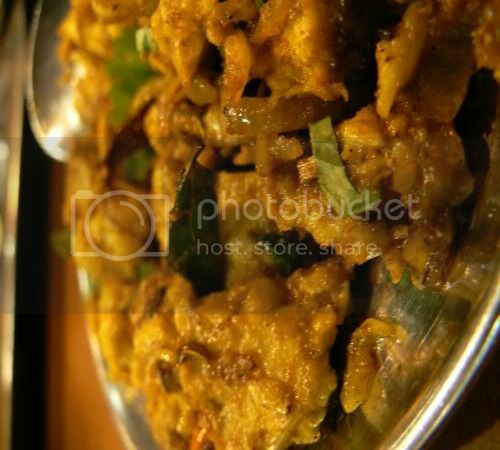 That night, we decided to go vegetarian and try out Saravana Bhavan which is part of a chain of vegetarian restaurants originating from Chennai, India that serves Northern and Southern Indian cuisine. There's a long list of their branches and they can be found all over India, USA, Canada, Singapore and etc. We obviously stood out like sore thumbs in the restaurant which was mainly packed with Indian families out for the night. Dishes were mainly recommended by the captain and they were all good although we had over estimated the amount we could eat. 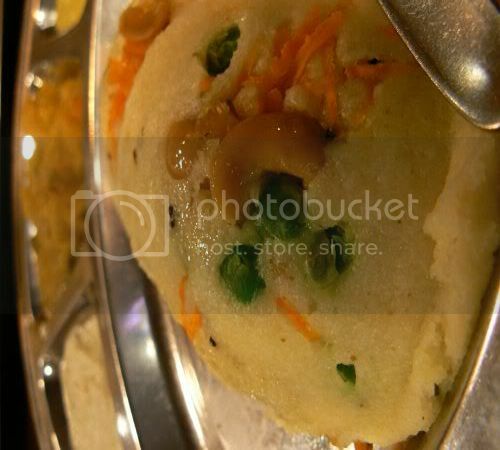 I had the recommended Rava Idly (RM4.50+) which came with a topping of peas, carrots and cashew nuts. The steamed rice cakes was something unusual as I have only seen plain ones. Splashie Boy had to have the Channa Bhatura (RM5.50+) as it's his absolute favourite. The bhatura is slightly deflated in the picture but I saw it nicely puffed up when it was in the kitchen (it's an open kitchen). 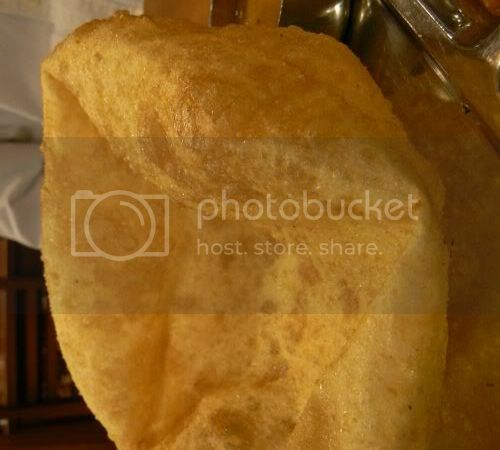 The bhatura is made by frying dough balls that has flour, baking soda and yoghurt curd. In this case, it's served with Channa that is chickpeas curry. We had quite a few side dishes which was too much for both of us to finish. Think the next time we eat here, we will just order one as the chutneys and curries they serve the idly and bhatura is sufficient for both of us. First we had their Vegetable Kola Puri (RM9.50+) which is basically mixed vegetable curry. We thought this was pretty ordinary. We had to have a Paneer (cottage cheese) dish hence we had the restaurant's Paneer Saagmala (RM8.50+) which came with lots of spinach gravy. This was yummy and we really liked it. This was pretty good even though it was vegetarian, the Saravana Special Vegetarian Chicken (RM8.50+). I liked the spices they used in this and the curry leaves dotting this dish. The next time we visit this place, we want to try out their special meals that come as a set with curries and a selection of poori, chappati or rice which seem to be pretty reasonable. The only bummer about eating here is the horrendous parking around Jalan Telawi that can drive a person mad but be warned as the authorities clamp down quite hard on illegal parking. I absolutely love the colours of this easy and yummy dish. Since I'm too lazy to cook up anything else to serve it with, the salsa and the fish is good enough for a light dinner. To make this meal, you can use any boneless fish cutlets you are comfortable with. I notice most households now use the frozen dory fish which is easily available in every supermarket. Although it's extremely convenient to use the fish, I prefer buying fresh fish fillets as they contain less water content when you pan fry them. The ones I usually get can be found at supermarket counters and it's a flat fish which they call "sebelah" in Malay. Pricewise it's slightly more expensive than the frozen dory fish. Incidentally I doubt it's dory fish but a river catfish that is raised in fish farms in Thailand and Vietnam. I think only Jusco labels the fish as Sutchi while the rest of the supermarkets call it Dory Fish. You can make your own Cajun spice as provided in the recipe or alternatively, buy them off the spice rack of any supermarket. My Cajun spice came from the bake shop which stocks all kinds of dried herbs and spices that they indiviually pack in plastic containers. Since I was out of coriander that night, I made do with sliced spring onions. The salsa is really yummy and for more zing, I added lime rind to it. Combine the salt, paprika, pepper, oregano and chilli powder in a bowl or a tray. Coat the fish fillets on both sides with the spices or ready made Cajun spice. Heat up oil in a heavy base pan and cook fish in batches, about two minutes each depending on how thick your fillets are. 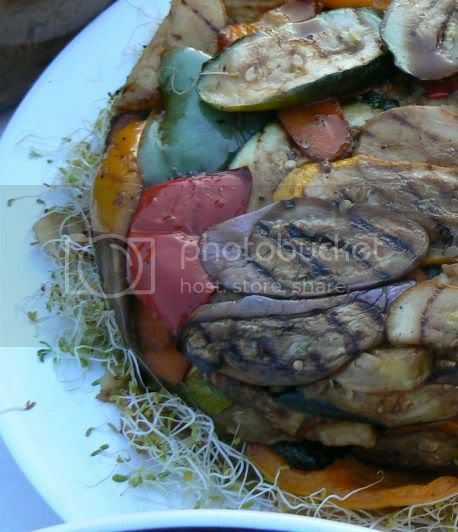 The coating on the fish will become blackened as seen above. If using frozen fish, make sure it's dry or else the coating will not stick on to it. To make the salsa, remove and discard the silk from the corn cobs. Cut the kernels from the cobs and boil, steam or microwave them until tender. I prefer mine with more crunch hence I don't like to cook it for too long so adjust the times based on what you like. 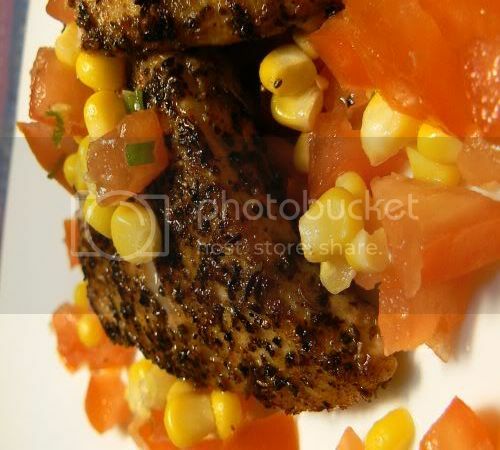 When the corn kernels are cool, combine with all other ingredients and serve with the fish fillets. This recipe makes four portions. 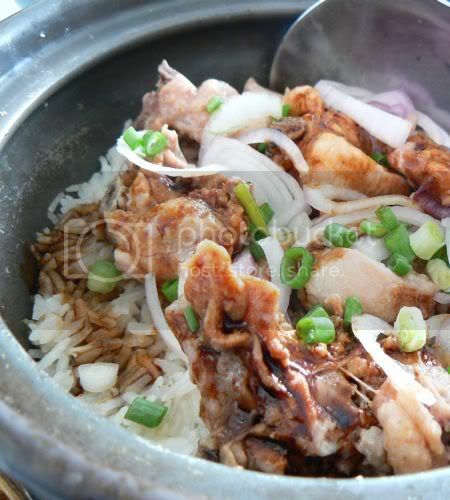 Ever since I started my quest to explore Pudu for their delicious food, people keep mentioning Heun Kee as a must try for claypot chicken rice. Located on Jalan Yew which is always jam packed with people going to the Pudu market, this restaurant is tucked just under the highway. There are lots of other notable eateries around Jalan Yew - Hup Yick's Fuzhou fishballs and May King's Lum Meen. Even though this place is jam packed all the time, if you are patient, you can easily get a car park at the public spots under the overhead bridge. People keep coming and going from the market hence the frequency of car spots being made available is quite high provided you are willing to wait a while. You can clearly see Heun Kee's claypot rice stoves which are placed right in front of their restaurant that is manned by two young ladies. A large metal pot of soup is also located next to the stove which is used to cook the claypot rice adding additional aroma. 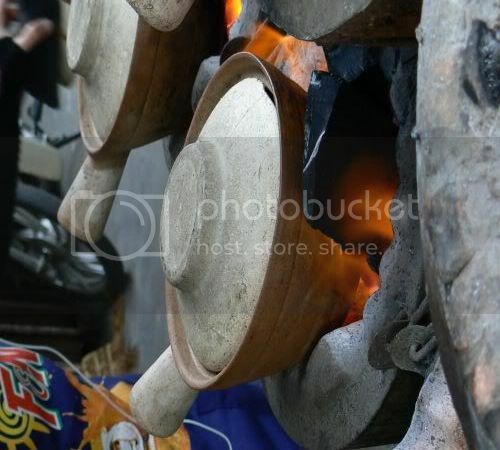 It seems they are famous for adding hot charcoal to the top of the claypot when they are cooking the rice. Strangely I didn't see this being done hence I am not sure if that method is reserved for special dishes. We had the claypot chicken rice which came with slices of Chinese sausage (Lap Cheong in Chinese) and salted fish. The rice cooked is slightly softer than the other claypot rice places but it is really nice and aromatic with the broth it has been cooked with. I wasn't too satisfied with the crusty bits at the bottom of the claypot as I felt they were not enough as I liked a nice mixture of crispy and cooked rice in my claypot. You can smell a slight whiff of rice wine when they first serve you the rice as a dash is added just before it's taken off the stove. Besides the claypot chicken rice, they also have claypot waxed meats rice which is seasonal and only available at the end of the year. 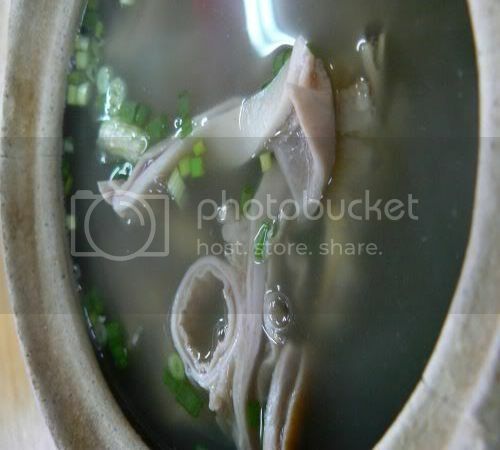 There's also a claypot chicken cooked with Chinese wine, claypot fish head curry, various soups, seafood tofu and the pepper soup filled with slices of the pig's stomach, chicken legs and lots of white pepper. We tried a small portion of the soup which came piping hot and filled with ingredients. I'm going to be extremely thick skinned this time round and ask all of you to cast your votes for the Best Asian Food Blog awards being run by Asia Pundit this year. I was nominated by Tigerjoe from Tiger's Den (thanks so much!). No pressure but hop over to this link and check out the nomination list which you will need to rank. Hope you will cast your votes soon as the deadline is 31 July, 2006. You will need to register your email to vote. May the best food blog win! 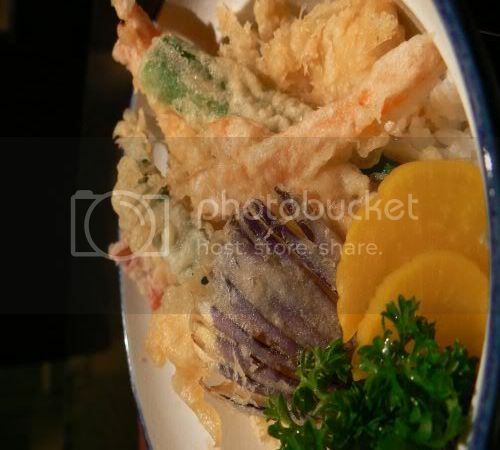 Recently we were at Desa Sri Hartamas for dinner and decided to go Japanese. The area is full of Japanese and Korean restaurants as you find them at every corner of the shophouses. However nowadays, there are appears to be more Korean places opening here versus Japanese places. This particular row of shophouses in Desa Sri Hartamas has a total of four Japanese restaurants i.e. starting with Nihonbashi that serves traditional Japanese cuisine, Aoyama the Green Room which serves more fusion style Japanese, Kin San Kichi that serves budget Japanese food and ends with Sugimoto that serves traditional Japanese food. It's strange but I have kinda avoided this particular restaurant so far as it has never appealed to me. However we decided to be adventurous and wander in one night. The menu is definitely presented differently and it's obvious their specialties are sashimi and makis as they had a long list of different items. Because it was a mid week dinner and before pay day, we had a simple dinner minus any expensive items. They served us salmon pickles which is made by the restaurant. Japanese restaurants buy their salmon whole hence they make these side dishes from the salmon parts which can't be used as sashimi and etc. 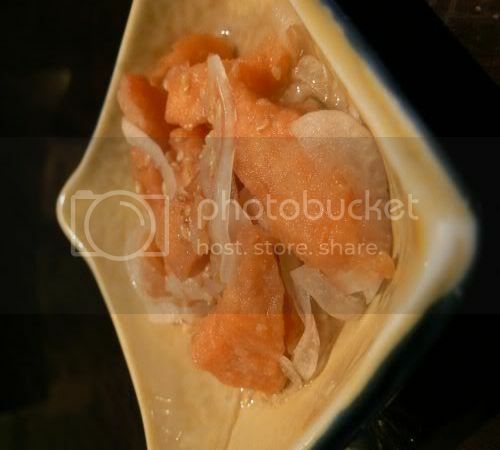 This is just a simple one with salmon pieces that have been fried and sliced onions which have been tossed in vinegar. Splashie Boy had the Teppan Seafood (RM26++) which had an assortment of salmon, oysters, calamari and prawns grilled in a cast iron pan. It had lots of butter though so it tasted great and there was a slight tangy taste to it that made it not so rich. We also like the rice they served it with, although it's just plain white rice but the taste is yummy. 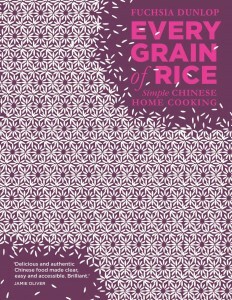 Most places scrimp on their rice and serve sub standard short grain rice. I was impressed with the Teppan Seafood but not their Tendon (RM20++) which is essentially assorted tempura served with rice. Sadly they failed in their Tempura as it wasn't crispy which is a cardinal sin in any Japanese restaurant. Reading back the reviews people wrote below, you are to ask them to recommend the dishes versus ordering from the menu hence I suspect Tempura is not one of their specialities. I also noticed the restaurant was mainly occupied by non-Japanese patrons probably because they don't really serve traditional Japanese menu items which is preferred. Will I go back again? I guess I will if someone is buying me dinner since I suspect you need to spend quite a bit to taste their special dishes. Incidentally, this place also serves Fugu fish, the deadly puffer fish if you wish to dice with danger. I wonder if they are certified to prepare the fish just like the licensed cooks which Anthony Bourdain visited in A Cook's Tour? This place seems to be the default restaurant we end up at whenever my friend, Ms. C is back from England. So far, we have tried their outlets in Suria KLCC and the Curve. It's been a while since I ate at the Mid Valley Megamall outlet which is the first outlet hence I thought I'll feature the individual dishes they serve here. This particular outlet is actually my least favourite as I find the service kinda lacking here. I suspect it's something to do with the layout of the place since the tables are quite spread out and in seperate areas which is difficult to monitor. 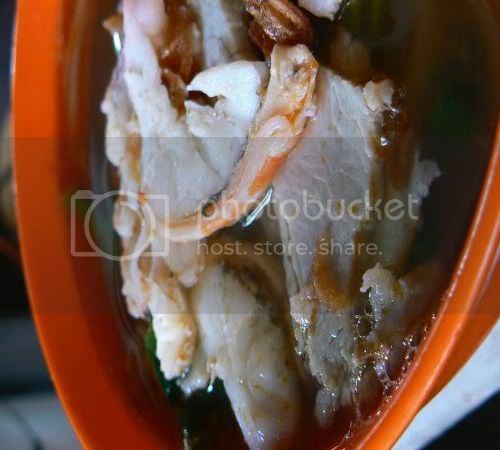 A must order when you eat here is their Lor Bak which is yummy and crunchy. The side order comes in a set of two and you can also get a taste of the Lor Bak in the rice sets that I featured in my Suria KLCC post. 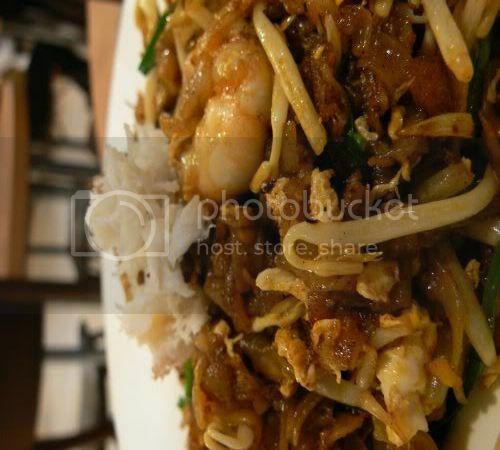 My friend's standard order whenever she eats here is their Char Kuey Teow which is yummy and comes topped with crab meat and prawns. You can ask them to add chilli to spice it up and she always orders extra chili. This takes a while to come so patience is a virtue. I usually have the Curry Laksa which I felt was quite watered down at this outlet. Didn't taste as nice as the one I usually eat at their Curve outlet so it was extremely dissapointing. We also had their desserts but since we were all chatting, I kinda forgot to snap them before we dug in to the red rubies and cendol desserts. The good thing about their desserts is they don't add a lot of liquid or coconut milk in the bowl and it's mainly shaved ice. It takes time for it to melt down but this means just the right amount of liquid vs the palm sugar syrup/coconut milk added in. 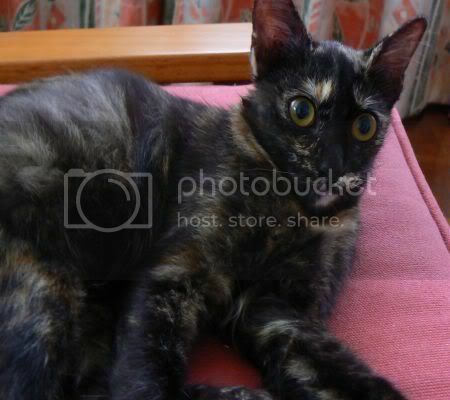 Recently, I was lucky to capture a rare picture of Ally Cat who was lazing at her favourite chair in front of my yellow silk cushions. Pictures of her are rare as she hates to pose but when she does, she knocks you flat with her cute pink nose and huge green eyes. Do check out Clare and Kiri at eat stuff this weekend - Clare is back in action and she promises pictures of Kiri in his new outfit which was knitted by her. Last weekend, Tourism Malaysia held the Citarasa (Foods and Flavours) Malaysia fair at the Malaysia Tourism Centre, Jalan Ampang which showcases the different varieties of food Malaysia offers. The food event is actually held for a whole month at various hotels but the official launch was held on Saturday night with the stalls opened throughout the weekend. The place was packed with locals and tourists who were there to sample the different kinds of food offered. One area showcased the participating hotels with their specialities as each of them were representing a different state. Armada Hotel in Petaling Jaya was making their famous Roti Canai Durian - still remember eating that for Ramadan Buffet before and it's really nice. As it was a busy weekend, we only managed to get there during dinnertime. There were stalls all over the place offering local specialities: a popiah basah stall which was vying for a record for serving popiah non stop, satay from the famous Sate Kajang Haji Samuri, Bahulu Classiq, keropok lekor stalls, char kuey teow stalls where they fry the noodles in front of you and the list continues. I'll only feature the stalls which we found unusual and interesting like this stall selling Sate Tulang (Satay with Bones in English) from Seremban. They were doing brisk business that night (much better than a famous Satay stall from Kajang) and I had to queue for a long time to try out their satay. 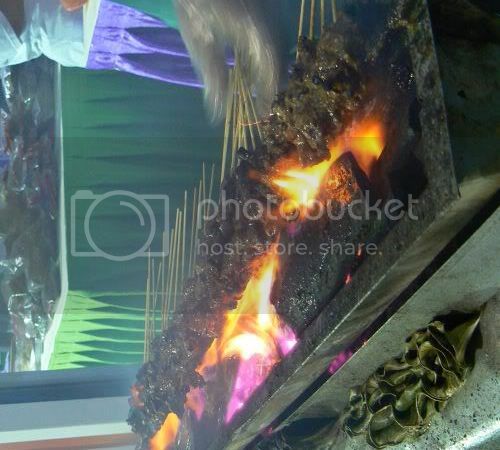 According to the people running the stall, sate tulang is actually chicken ribs crushed and cut into smallish pieces. 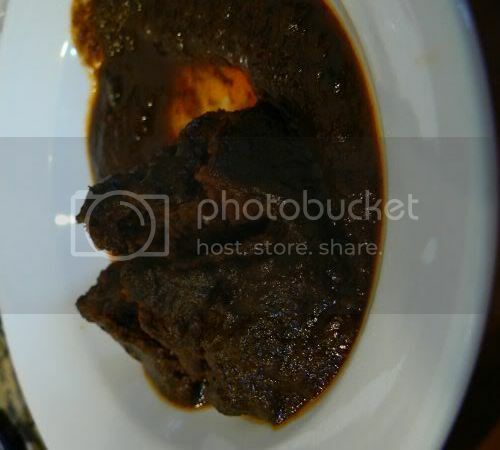 It is marinated with a sauce devised by the stall owner's grandfather and is made from seven spices. The fella who runs the stall is a young chap who has just recently opened his own place after running his father's stall in Seremban. It's the first time I have ever heard of this variant of satay before and he told me it's extremely popular in Seremban. Taste wise - it was really yummy and juicy. You will need to sit down and eat it slowly though as some of the bones are crushed quite small. 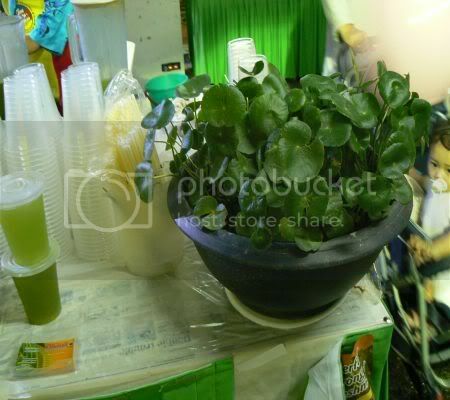 Another extremely unusual item we found was a stall selling pegaga juice. Pegaga (known as Indian Pennyworth in English) is a popular herb in Malaysia that is usually eaten raw in salads and said to have medicinal properties. The herb is used as a tradition medicine and said to be able to treat high blood pressure, fever, toothaches and even improve memory. Some also claim that the herb can help cure malaria and dengue fever. The juice was nice and refreshing that kinda reminded us of sugarcane juice. Next to the Sate Tulang stall was a stall selling dodol which is essentially carmelised sugar and coconut milk. Traditionally, it's stirred for a long time over a slow fire until the mixture thickens to a doughlike consistency. For commercial purposes, they use a machine like the one above to mechanically stir the mixture. 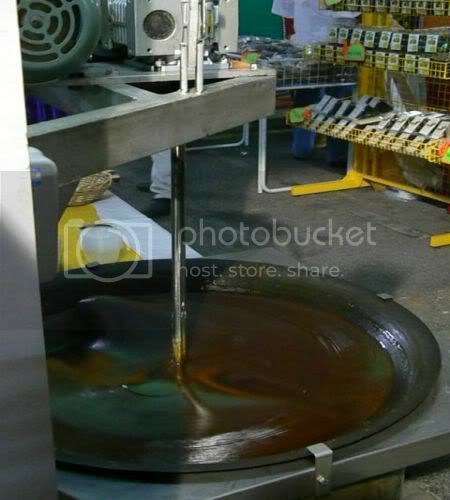 The dodol is then cut into small pieces and packed individually in plastic. Usually it's flavoured with pandan and if you're adventurous, they also have durian dodol with a mild taste of the fruit. I'm currently in a sweet tooth phase hence I have been churning out things I normally don't make. This was inspired from the latest Donna Hay magazine with her lovely couture cupcakes on the cover. I also wanted to try out my mini cupcake papers which I recently found. The cupcakes were not perfect in terms of looks and I had some major issues with my frosting but I really like the moist cake that was easy on the tummy since it was bite size. Looking at the ingredients that went into the cupcake, I can understand why it tastes great since it was full of yummy stuff. Not sure why but my cakes seem to pull away from the paper after I left them out a day until I frosted them and took the pictures. The reason for the delay was because I had such issues with my frosting. The original recipe calls for a whipped cream icing that is to flop on top of the cupcake. I tried that and it just didn't flop nicely and I felt it was too tasteless for my liking hence I tried to make another version. I was veering toward a traditional buttercream one when I saw Donna Hay's meringue icing and decided to try it out. It's simple to make and surprisingly it holds really well in our hot weather. Only bummer about this icing is it's really sweet as you need to add the sugar to whisk the meringues. I will need to experiment further with it to see if I can reduce the sugar content without affecting the texture of the icing. After icing them and taking snaps of the cupcakes, I reckon they remind me of little "Caspers" i.e the friendly ghost with their snow white puffs. Preheat oven to 160C. Place butter and sugar in the bowl of an electric mixer and beat until light and creamy. Gradually add the eggs and beat well. Sift over the flour, hazelnut meal and baking powder and beat until combined. Fold through the milk and melted chocolate and spoon mixture in preferred cupcake papers - the original recipe is for 12 large size cupcakes but a half recipe yields twenty tiny cupcakes using the above cupcake paper. 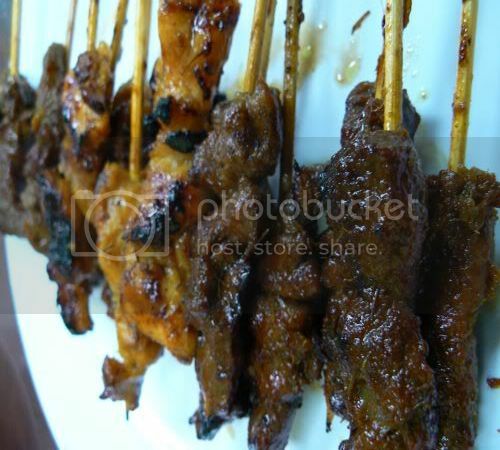 Bake for 15 to 20 minutes until cooked when tested with a skewer. Allow to cool slightly. When warm, make a hole with a paring knife in the centre and remove the cake centre. Fill with marshmallows and hazelnut spread. Take out a bit of the cake centre and add back the cake top only. 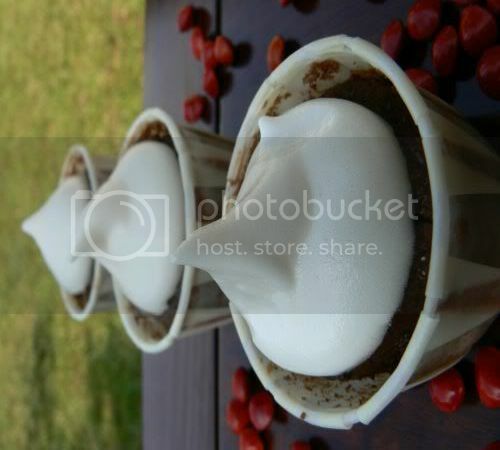 To make the whipped cream topping, place everything in a bowl and beat until soft peaks form. Don't overbeat or else it will become hard. Spread on top with a palette knife. To make the meringue icing, place sugar, water, vanilla essence and cream of tartar in a saucepan over high heat and stir till sugar melts. Bring to boil and simmer over low heat for 3 minutes. Place eggwhites in a bowl and whisk till soft peaks form. Add sugar syrup slowly with motor running and beat till thick and glossy. Spread on top of cupcakes. Some days you stumble on great finds and I recently had one of those good days. I was dithering around Jalan Pudu trying to find food to fill my hungry tummy when I found this small lane with two coffee shops flanking it. If you wander up the tiny alleyway past the cloth shops, embroidery shops, the Indian rojak and cendol man and etc, you will hit the Pudu Market. I headed towards the shop which is right next to the hardware shop as it was super busy during lunchtime. A quick observation of the place indicated it was the Prawn Mee (Har Meen or Mee Yoke in Chinese) stall which was doing brisk business hence I ordered a small bowl (RM3.50) to try. The stall is run by a Chinese couple who was non stop doling out bowls and bowls of the noodles. They will assemble the ingredients at the stall depending on what toppings you want, cook the noodles and then turn around to a huge metal vat to spoon the piping hot prawn broth over it. As I was sitting near their stall, I had fun observing them and could see a variety of different toppings you could request for: big prawns, chicken meat which is shredded or chopped, pork slices, fishballs in a form of a long flatcake, chicken liver and etc. Everyone was adding ingredients to their noodles making mine really plain that I was itching to order another bowl chock full of the ingredients. Based on the sign at their stall a large bowl will cost RM4.50 while the big prawns will cost RM6.50. What I love about these noodles is the prawn broth it came with - extremely sweet and delicious that I drank every spoonful of it. It's not thick but so full of flavours that you'll want to ask the couple to add more soup to your noodles. Do give this place a try as the prawn mee is delicious. Back to street food after all the scrumptious food we had. I wanted to blog about BKT we had yesterday in Yin Xin Gie at SS4, Petaling Jaya but it was by far the worst I have ever had. It's the herbal and clearer soup type which just didn't taste like the real thing at all. I guess people think differently as the shop was quite packed with people. 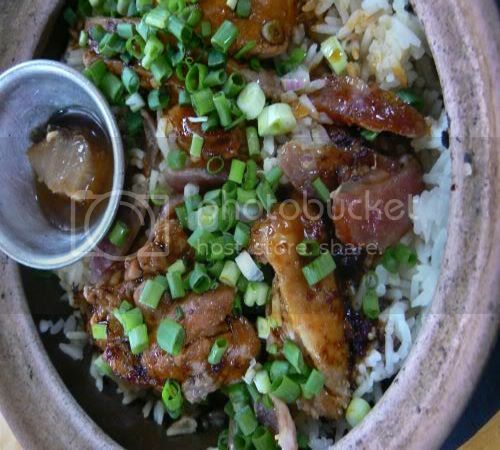 I had this some time back, it's claypot drunken chicken rice (RM6) where they had sloshed on Chinese rice wine which gives the rice a wonderful aroma. 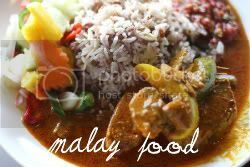 This place in Cheras specialises in different varieties of claypot rice which is similar to Busy Corner in Damansara Jaya, Petaling Jaya. Here you can get ten types that range from the drunken chicken, bean curd sauce chicken, mutton, fish and black pepper beef rice. It makes a change from the usual claypot chicken rice with salted fish but the rice needs to be a bit more crispy at the bottom which is what I like. It's also hard to tell this place sells claypot rice as they cook it at the back kitchen hence you don't get to see the cooking in action unlike most of the other places. 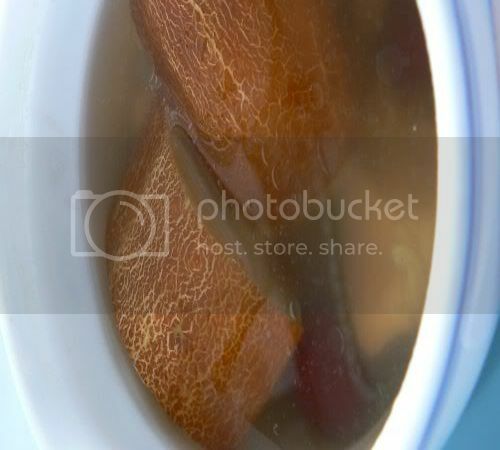 A must have when you eat claypot rice is the steamed soups they serve with it. This is my standard order as I love old cucumber soup. It's always been my favourite since I was a kid and the best part is the scooping out of the flesh from the old cucumber. As these are steamed versus the home made ones which are boiled, the old cucumber is not so tender. The soup is always full of ingredients i.e. red dates, dried oysters, dried octopus, chicken pieces and chicken legs to give it a great flavour. We had lots of fun last night at the barbeque - it was a feast of food and laughter especially with the video show at the end. Barbequing started early before the sun went down and A, the appointed "Fire Man" was on hand to show us his pyromaniac skills. 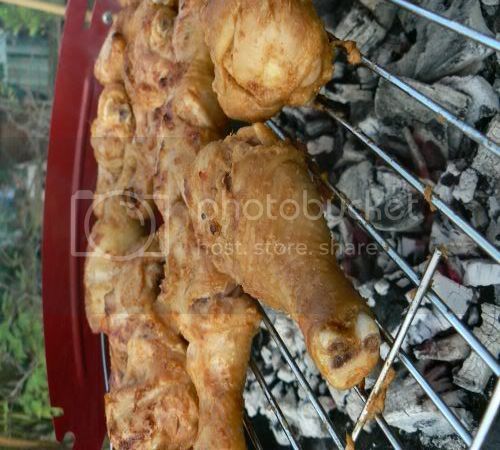 See how nicely heated up the coals are which were perfect for barbequing his special chicken drumsticks. 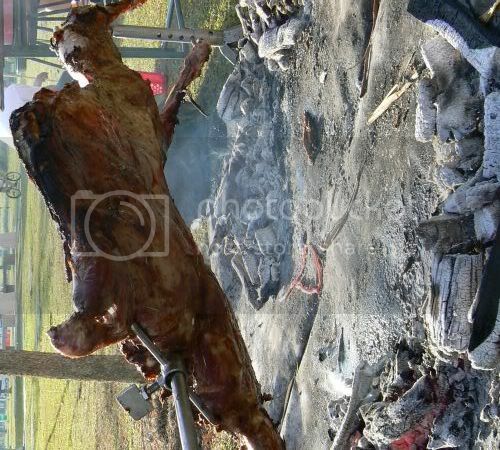 We also had one whole roast lamb which a caterer was slowing roasting in their own made spit. The lamb was fantastic especially when it was piping hot. I didn't take many pictures but A was on hand to show us how finger licking his chicken drumsticks were with his special secret marinade. He also got the yummy lamb leg - see the crowd of people hovering at the back for the roast lamb. 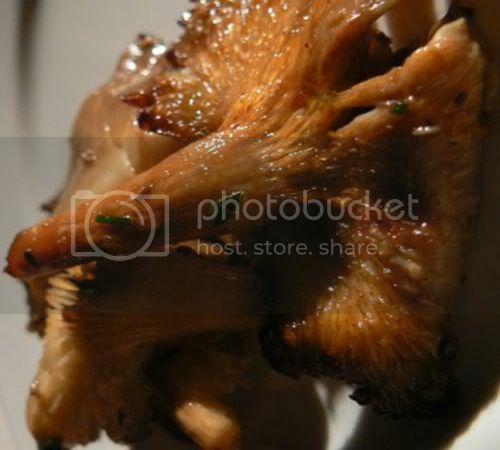 This deserves special mention - the dish of the night was the grilled mushrooms. 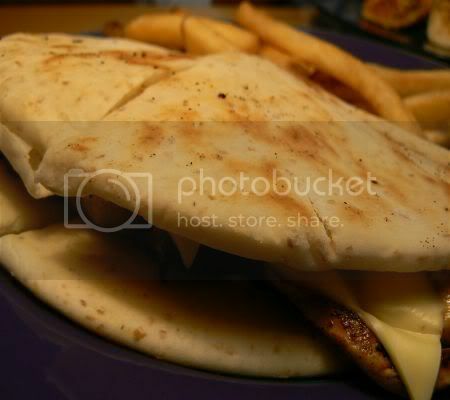 It was marinated and then grilled on the fire that was an instant hit at dinnertime which everyone finished up. We were all trying to figure out what was in the marinade since it was catered. There was a lot of food! So much that we couldn't finish it and had lots of leftovers. There was potato salad, waldrof salad, grilled vegetable salad, garlic bread, noodles, sausages, nuggets, muruku and etc. 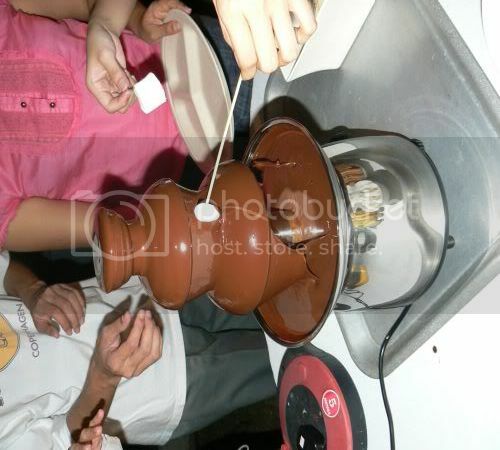 The ultimate treat - the chocolate fountain. We had a selection of banana, marshmallows and chocolate wafers to dip into the fountain. Yummy stuff! There were also lots of cakes - Nutella Cupcakes, Brownies, Mango Mousse Cake from Chef Jerome and White Chocolate Macadamia Cake from Secret Recipe. Extremely great fun and thanks so much to everyone especially Stephen and Sharon, the hosts. They have a lovely home which everyone has nicknamed as "Stephen's Corner" - definitely the ultimate place for garden parties. Where's Kiri and Clare? We miss them terribly and hope they are okay as we haven't heard from them for quite some time. In the meantime, I'll continue to beg Mummy for baked goods even though they are forbidden to me. I sniffed the chocolate glazed hazelnut mousse cake and it was heavenly but Mummy banned it from me since chocolate is toxic. Then she refused to give me Nutella cupcakes yesterday so I sulked the whole day. Life is so unfair! Never mind, at least I stole my big sister's favourite sleeping place which is just under the air-conditioner. Thank God it's Friday! How about celebrating the weekend with this sugar high and chocolatey treat? I made this mousse cake during one of my crazy moments to test out a recipe I found in the Gourmet magazine which a kind friend lent me. We're invited for a barbeque on Sunday hence I wanted to make this as a treat. Although everything turned out well for the cake and it's really simple to make, I doubt it will survive the journey to Kota Kemuning since it's mainly mousse. Kinda sad but I don't think the crowd of people will appreciate eating a pool of chocolate mess. I guess it means making non frosted items like Nutella Cupcakes and brownies. Back to the treat above, it's really amazingly simple to make and the best part about Gourmet and Bon Appetit recipes is you can search on their Epicurious website and read other people's reviews and recommendations to rectify the recipe. Two concerns were evident when I read through the reviews: it lacked hazelnut taste hence one recommendation was to add hazelnut liquer and the quantity in the recipe made quite a short cake with an 8 inch springform pan. They were right about the taste as it definitely needs an addition of hazelnut syrup which I did not have so it looks like I may have to buy some the next time round. For my cake, since all I had at home was a 7 inch springform pan, I used that and got a pretty decent height. Not sure why but my chocolate ganache wouldn't really dribble down the sides hence I used a palette knife to smoothen it as best as I can. I'm also not sure why their picture shows chocolate ganache that is so much darker even though I used at least 70% cocoa mass dark chocolate already. The best part about this cake is it's really nice and light that you don't feel like you are indulging in something really naughty. Simple to also make which is a bonus. At first I thought the base will crumble on me when I flip it out but it was sturdy enough to withstand moving it around and removal of the greaseproof paper. I'm adding the recipe below in metric form for everyone's ease and the link. Make shortbread base:Put oven rack in middle position and preheat oven to 350°F/180C. Invert bottom of springform pan (to make it easier to slide shortbread base off bottom), then lock on side of pan and line bottom with a round of parchment paper. Pulse hazelnuts with sugar in a food processor until nuts are finely chopped. Add flour, butter, cocoa, and salt and pulse just until a dough forms.Press dough evenly onto bottom of springform pan with your fingers. Prick all over with a fork, then bake until just dry to the touch, about 18 to 20 minutes. Transfer base in pan to a rack to cool completely, about 30 minutes. Remove side of pan and carefully slide out parchment from under shortbread, then reattach side of pan around shortbread base. Make mousse while shortbread cools:Sprinkle gelatin over water in a 1- to 1 1/2-quart heavy saucepan and let stand until softened, about 5 minutes. Heat gelatin mixture over low heat, stirring, just until gelatin is melted, about 2 minutes. Whisk in chocolate hazelnut spread until combined and remove from heat.Whisk together mascarpone and chocolate hazelnut mixture in a large bowl. Beat together cream, cocoa powder, and sugar in another large bowl with an electric mixer at low speed until just combined, then increase speed to high and beat until cream just holds soft peaks. Whisk one third of whipped cream into mascarpone mixture to lighten, then fold in remaining whipped cream until well combined. Spoon filling onto shortbread base in pan, gently smoothing top, then chill, covered, at least 3 hours. 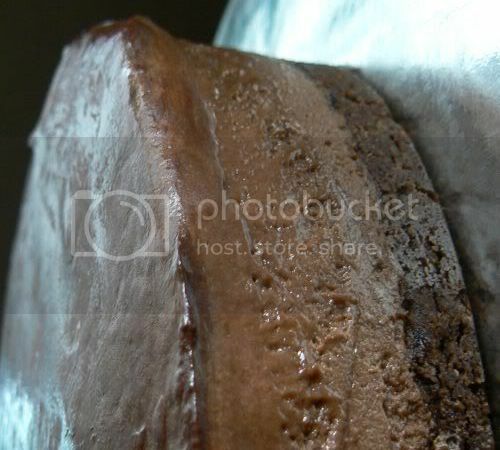 Make ganache and glaze cake:Bring cream to a simmer in a small heavy saucepan and remove from heat. Add chocolate and let stand 1 minute, then gently whisk until completely melted and smooth. Transfer ganache to a small bowl and cool, stirring occasionally, until slightly thickened but still pourable, about 20 minutes.Run a warm thin knife around inside of springform pan, then remove side. Slide cake off bottom of pan and transfer to a serving plate. Pour ganache onto top of cake and spread, allowing excess ganache to drip down sides. I'm kinda hooked on Nasi Padang hence during the weekend, we decided to explore Desa Pandan. The place is a hub for Nasi Padang restaurants as in one square of shophouses, there are three different outlets at each row facing each other. When you drive in from McDonald's, the first one on your left is Sari Bunda, go straight and turn right and you will see Sari Ratu. Facing Sari Ratu at shophouses across is Restoran Sederhana. Although some of you recommended us Sari Bunda, we decided to try out Sari Ratu since it was the one that was thoroughly packed that day with Indonesians. We ordered a variety of small dishes from the counter - first was the Ayam Pop (RM6++) which is kampung chicken (free range chicken) that has been soaked in brine and then deep fried. It's served with tapioca leaves and a sauce akin to rojak. Slightly different way of serving it here as usually they give a chilli sauce instead. This was my favourite - crunchy baby eels (RM7++) (Belut Balada in Malay/Indonesian) that is deep fried and coated in a chilli sauce. You may think it's strange but they taste great. Even Splashie Boy who hates these wriggly stuff liked it. 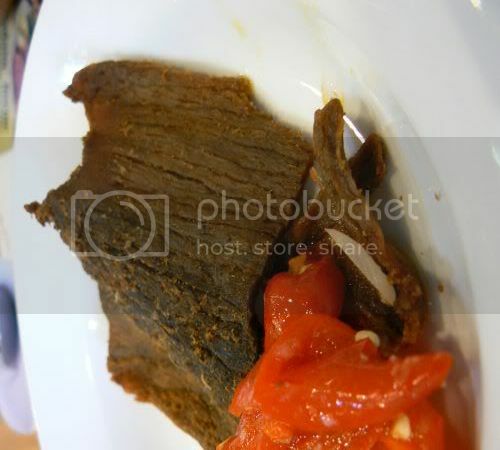 The Dendeng Daging (RM5.50++) i.e thin beef slices fried till crispy and served with chili sauce. Although this was better than Salero Negori, I still did not like this one as it wasn't paper thin enough to make it crispy. Their rendang daging (RM5.50++) is pretty good too and I love the sauce which is great with rice. Splashie Boy insisted we have these Sayur Buncis (RM3.50++) (Long Beans in Malay/Indonesian) which is his favourite. 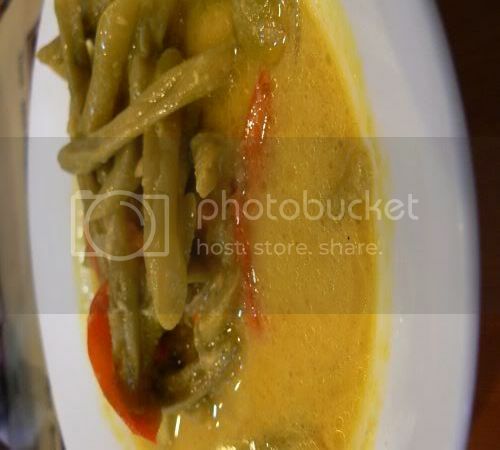 It's cooked in a creamy curry that is like sayur lodeh. Out of all the Nasi Padang places we have been, this version is his favourite. 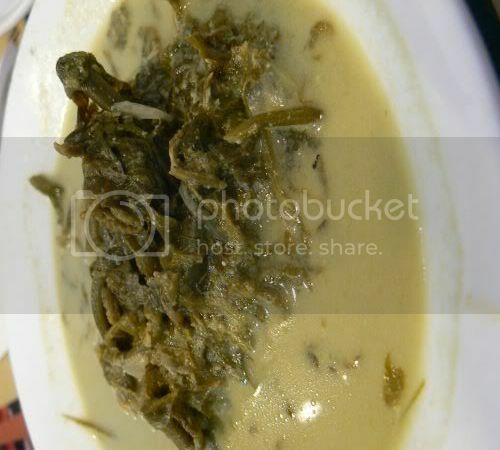 I had to have my Sayur Pucuk Paku (RM3.50++) (Fern Leaftops) - my essential whenever I eat Nasi Padang. 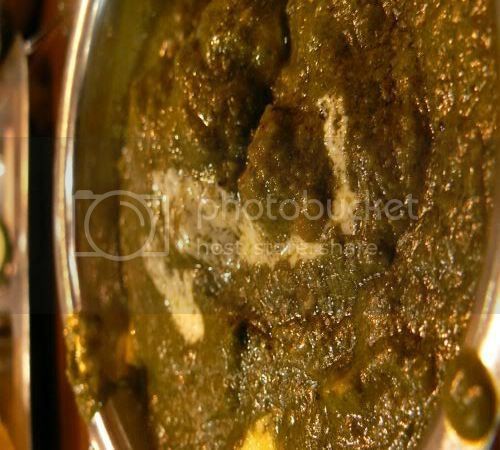 This version is very creamy and packs a punch with the green chillies. 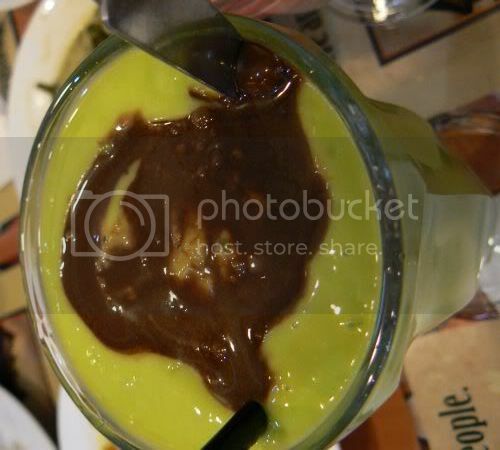 Another must have when you visit a Nasi Padang outlet - Alpokat Juice (RM6++) that is made from Indonesian avocados and is drizzled with chocolate sauce. The juice is so thick that one is enough to fill you up. Don't forget dessert - Indonesia's version of our Ais Kacang i.e. 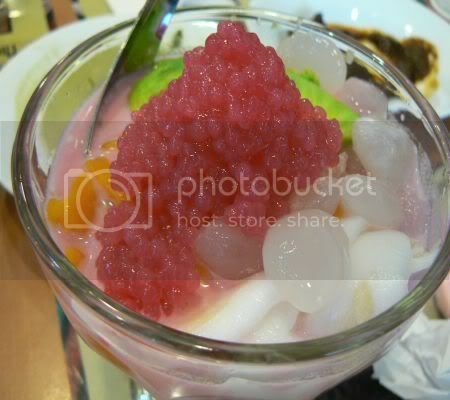 their Ice Teler (RM6++) that is topped with avocado, coconut slices, palm seeds, jackfruit and pink colour sago. Really yummy stuff. Besides these dishes we ordered, we saw other tables ordering Fish Head Curry, Ikan Percik (grilled fish), Ikan Nilam Goreng (Fried fish) and etc. One table next to us had so many dishes that they were hard pressed to look for space on their table. From what I gather, Sari Ratu is a popular chain of Nasi Padang restaurants in Indonesia. They have three outlets in Malaysia: one in Jalan Sultan Ismail, this one in Desa Pandan and their latest one at Ampang Waterfront in Taman Kosas. The food here is pricier than Salero Negori but more authentic. I guess with more and more Nasi Padang places we try, we will get a better feel of the different tastes and budgets offered. 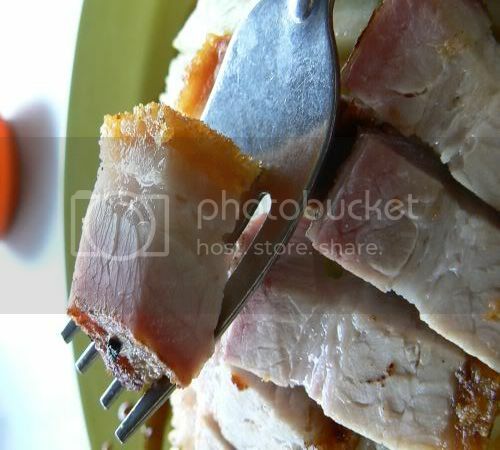 I was recently introduced to this excellent roast pork found at a coffee shop in Section 17. It's strange as I have obviously been eating at the wrong barbequed meats stall all the while since the one we use to frequent is just down the road from it. The skin is crunchy while the meat has a melt in the mouth quality probably because they use the three layer type of meat with lots of fat. Comparing this to my usual haunt i.e. Lucky Seafood Restaurant - this one has more fat hence it's nicer to eat. It's also slightly more expensive as a plate of roast pork rice costs RM3.70 versus Lucky's RM3.50. 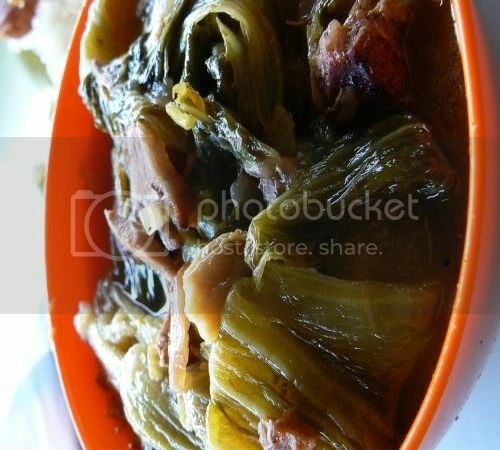 The stall also sells Ham Suen Choy or Pickled Mustard Greens (RM1.50) i.e pickled mustard greens that is made with leftover barbequed meats and bones to give it extra flavour. 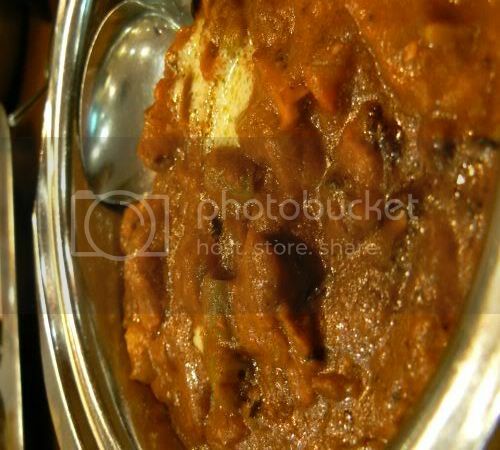 Tamarind (assam in Malay) is added to give it a sourish taste and it's stewed for a while for the flavours to develop. This version I felt did not have enough tamarind in it and needed to be more sourish. Besides the barbequed meats stall, there are also lots of yummy food here. We like the Curry Laksa here which serves their version without chicken but vegetables and fish ball. 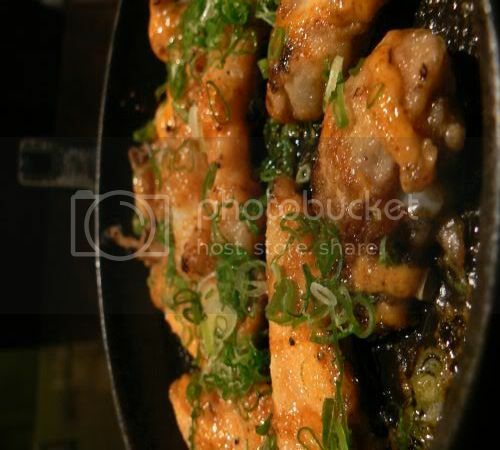 There is also a stewed duck stall which allows you to pick and choose from a variety of vegetables, deep fried fish, stewed tofu and stewed duck to be eaten with rice. The yong tau foo stall is also good especially their stuffed tofu which is nice and smooth. On Friday night, we were at a lost on what to try out for the evening. One suggestion was to test the waters out at this very new place in Desa Sri Hartamas called Mama Mia Super Cafe which serves yakitori and cakes. A quick check at the place showed it was empty - not a great sign of its foodworthiness hence we decided to give it more time to hopefully gather a fan club. Then, we saw the roadside banners advertising Coast at Hartamas Shopping Centre. Splashie Boy was hooked when he read it was Tex Mex food - his absolute favourite and despite my protests telling him, I read Honey Star's blog which said the food was horrible, he insisted we give it a try. The restaurant which is visible from the main road is at the same row as Paddington House of Pancakes and Eric's Deli. Incidentally, it looks like Penang Village is due to open opposite it in July. This place also has a branch at Putrajaya's Alamanda shopping centre. Since there seemed to be a pretty decent size crowd tucking into their food there, we decided to give it a try rather than fall back to the usual Rakuzen. The place is a real knock off from Chillies/TGIF with rockstar memorabilia on the walls, booths with pendant lights and extremely similar looking food. 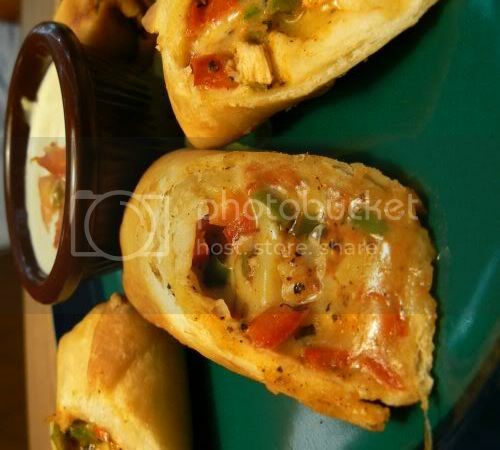 There was Cajun Spring Rolls that looked like Mexican Egg Rolls in Chillies, Macho Chicken which seemed to be a close cousin to Monterey Chicken in Chillies minus the beef bacon and Chicken Tempuras that was looked like the Chicken Crispers with Honey Mustard Sauce. The menu also has burgers, fajitas, ice cream pie and two Asian dishes i.e. 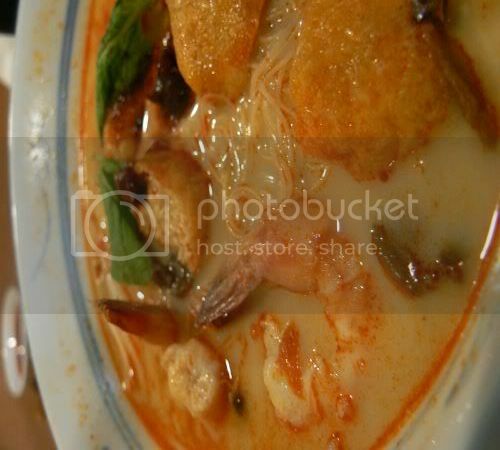 a tom yam seafood spaghetti and deep fried tofu. We wanted a light meal, hence we ordered the Cajun Spring Rolls (RM12++). Tastewise it was not bad and slightly spicier than the Mexican Egg Rolls in Chillies. The dip was pretty watered down though. We then shared the Chicken Tejas (RM15++ with a drink) which bears a great resemblance to the newly launched KFC Cheesy BBQ Meltz that is said to be retailing at RM5.50. This was pretty good although it would have been even nicer if they had used a mix of mozzarella and Monterey Jack cheese versus the tasteless Kraft Cheese slices. Fries were cut like Chillies but not as crispy. 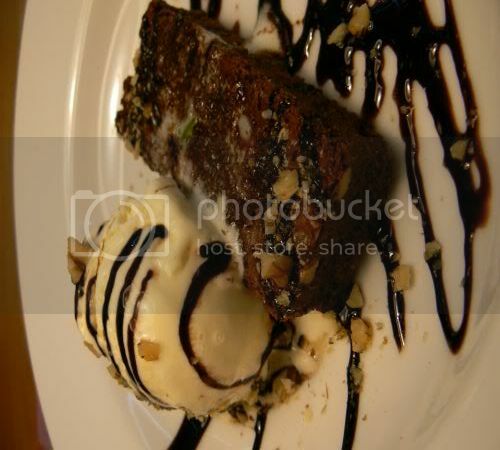 They are currently having a promotion till 31 July, 2006 - spend a minimum of RM15 to get one Chocolate Brownie which is priced as RM9++ on the menu. The brownie was chunky with nuts but slightly dry. During the meal, we both had a long discussion on what we thought the food was like. The conclusion at the end of the night was the food here is a copycat of Chillies which uses more locally sourced ingredients hence the significantly cheaper prices. We kinda suspect Chillies' food could have maintained their standards as most of their stuff is imported in from the USA or be pre-packaged to keep their secret formulas intact. If you want Tex Mex food at reasonable prices that will not burn a hole in your pocket then I would certainly recommend this place but if you want real Tex Mex stuff, just head over to Chillies. Be warned though as I think the portions are shrinking at Chillies as they are not increasing their prices. Incidentally, when we left the place, it was full of people which is such a total contrast to the extremely empty Retro American Diner on Hartamas Walk. I dug around my photo archive and found it - don't you think it has the tri colours of the Italian flag - red, green and white? It's really simple to make with basil leaves and shaving of parmesan cheese. During my mini photo session, my parmesan cheese melted a bit though. I usually buy chopped tomatoes - it's easier since the fresh tomatoes we get can sometimes be sourish. To make the sauce, it was simple to just cook it down with chopped garlic and one red chilli to add spice. This chilli was added after I read Jamie Oliver's Jamie's Dinners which recommended it. This makes a yummy tomato sauce which goes so well with pasta. 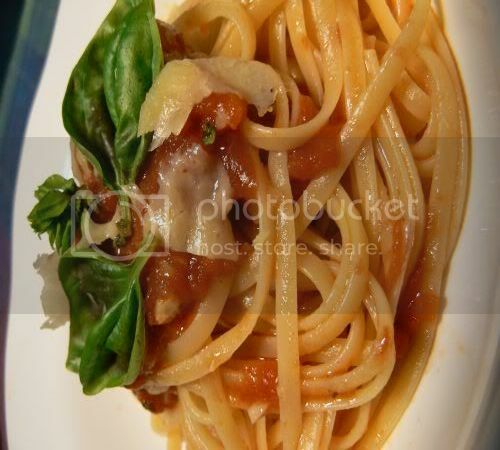 You just shred basil leaves and mix it with the pasta and sauce as it adds a great fragrance. Top it with lots of parmesan cheese and you have a simple meal which would probably cost you a bomb outside.